Many older adults are desperate for volunteer transportation. 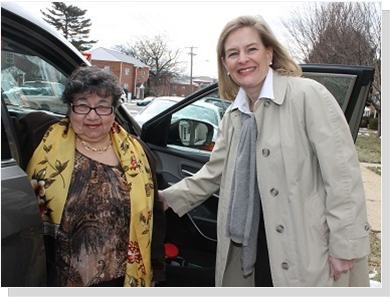 NV rides is now partnering with the Shepherd’s Center Annandale-Springfield to support non-driving senior adults. Volunteer drivers give non-driving seniors the gift of a lift by providing needed rides to medical appointments and the grocery store. The Shepherd’s Center (SCAS), is a non-profit interfaith organization sponsored by area congregations and community groups to serve older adults to continue to live independently in their own homes. “The Shepherd’s Center’s transportation program is a tremendous help to me in getting to my doctor’s appointments,” said Trudy, a SCAS client. The number of older adults in Northern Virginia is growing at twice the rate of the rest of the population. At the top of the list of emerging needs for older adults is transportation. As a response to this growing need in our community, the Jewish Community Center of Northern Virginia (the J) has teamed with Fairfax County, Jewish Council for the Aging (JCA) and Community Foundation for Northern Virginia to assist organizations that provide older adults with volunteer transportation, so they can live independently in their home for as long as possible. Partner organizations stay autonomous, yet receive value added benefits from being part of the NV Rides network of service providers. Benefits to partner organizations include an Internet based ride scheduling software, marketing support, volunteer coordinator support and volunteer background checks at no cost to the organization. Volunteer drivers are needed to support senior adults in Annandale and Springfield. Volunteers choose their own schedule, driving once or twice a month or as often as they like. If you are looking for a rewarding and flexible volunteer opportunity, consider being a volunteer driver. Just two to three hours of your time per month, at a time that is convenient to you, can make a difference to a senior who is no longer able to drive. To learn how you can help put yourself in the driver’s seat, or is you think your organization can benefit from NV Rides, visit www.NVRides.org, or call Jennifer Kanarek at 703-537-3071. For more information about SCAS call 703-941-1419 or visit www.ShepherdsCenter-Annandale.org. If you are on Facebook, please Like us so that you can receive the latest news and updates about the program. Both the Shepherd’s Center and the Jewish Community Center are members of the Annandale Chamber of Commerce. Congratulations and thanks for the valuable work you do in our community.